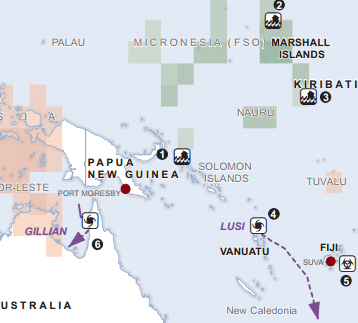 The OCHA Asia-Pacific Weekly Regional Humanitarian Snapshot for 4-10 March focuses on flooding in Papua New Guinea, king tides affecting the Marshall Islands and Kiribati, Tropical Cyclone Lusi in Vanuatu, the dengue fever outbreak in Fiji and the Tropical Storm Gillian in Australia. Click here to read the humanitarian snapshot. This entry was posted in News and tagged Asia-Pacific Weekly Humanitarian Snapshot, Australia, Fiji, king tide, Kiribati, Marshall Islands, OCHA, Papua New Guinea, Tropical Cyclone, UNOCHA, Vanuatu on March 11, 2014 by United Nations.